Not sure I agree with this yet but it’s a chilling scenario. A recent survey commissioned by the New York Times found that people who could find North Korea on a map were more likely to favor talks over military action. A glance at North Asia’s geography explains why. More than six decades after the Korean War ended without a peace treaty, the peninsula remains bisected in a perpetual stalemate, with the U.S.-backed South Korean military lined up against more than a million North Korean troops. While tensions have occasionally flared — such as after Kim Jong Un’s weapons tests or threats of “merciless revenge” over American-led military exercises that began Monday — the two sides have so far staved off another devastating conflict. 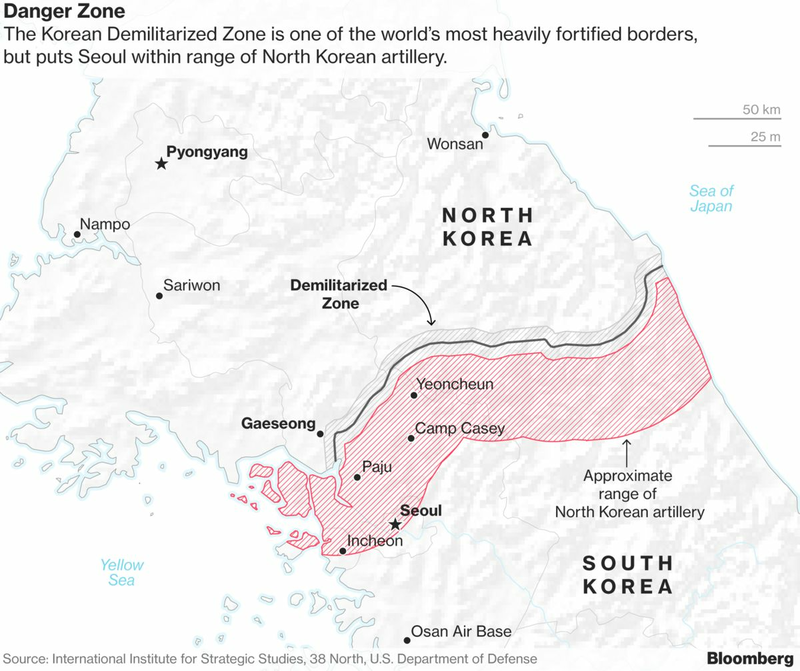 The 250-kilometer (160-mile) border defined in a 1953 armistice lays bare one obvious peril of any confrontation: The demilitarized zone sits on the doorstep of the Seoul metropolitan area, where about half of South Korea’s 51 million people live. North Korea has spent decades concealing hundreds of artillery batteries along the frontier that could wreak havoc in the southern capital, according to Joseph Bermudez, an analyst for the 38 North website run by the U.S.-Korea Institute at Johns Hopkins University’s School of Advanced International Studies. Those weapons could kill thousands of people and damage scores of factories in the time it took the U.S. to project “fire and fury” across the border, as President Donald Trump has warned. 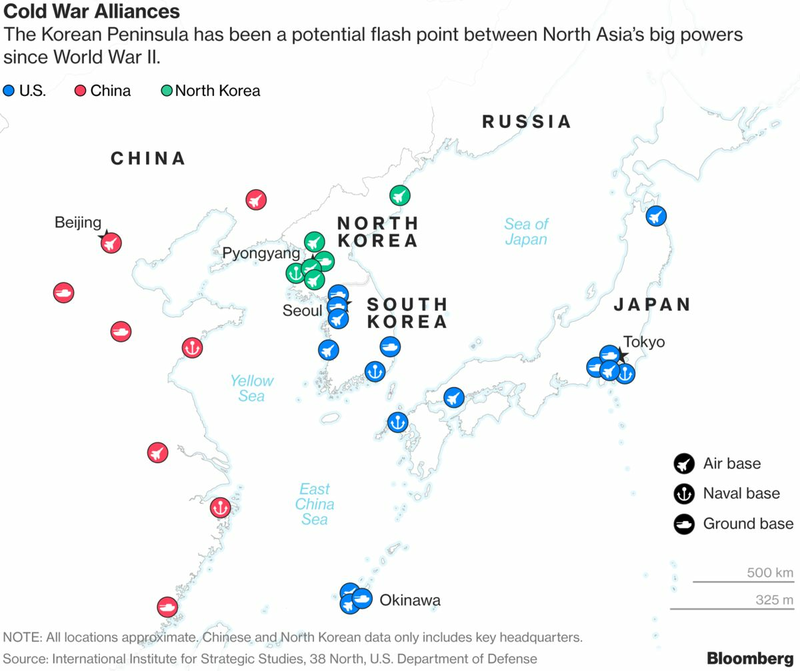 After an initial exchange of fire, the danger could quickly engulf the rest of South Korea and neighboring Japan, countries that have been American allies since World War II. 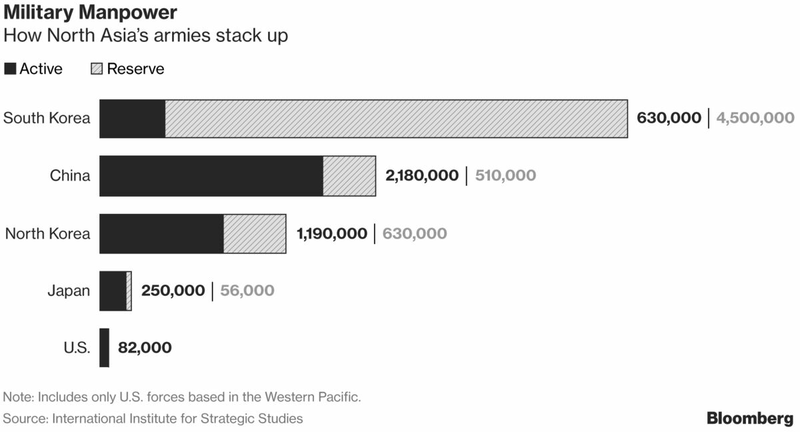 More than 80,000 troops are based across the two countries and the U.S. territory of Guam, which would provide key staging areas for any American-led attack. Those U.S. bases were within reach of Kim’s bombs long before his first successful test of an intercontinental ballistic missile on July 4. Even if Kim still lacks the capacity to outfit those missiles with miniaturized nuclear warheads, he could cause plenty of damage with conventional and chemical weapons. Kim would probably seek to maximize his advantage against more powerful foes by striking softer civilian targets in places like the greater Tokyo area, which is home to almost 40 million people. At the same time, North Koreans might look to escape the allied onslaught by flooding across the Yalu River to China. The region might also face environmental threats should the U.S. strike Kim’s heavy-water reactor north of the capital Pyongyang, scattering radioactive debris into the atmosphere and groundwater. Mao Zedong’s decision to back China’s communist neighbors in North Korea was a key reason the U.S.-led United Nations forces were never able to achieve a decisive victory in the Korean War. China’s concern then — that a unified Korea could provide a springboard for attacks on its own territory — remains largely unchanged. And the world’s most populous country would be hard-pressed to remain on the sidelines if a full-fledged conflict erupted on its border. Unlike his predecessor, Chinese President Xi Jinping commands a nuclear power with one of the world’s most advanced navies and air forces. 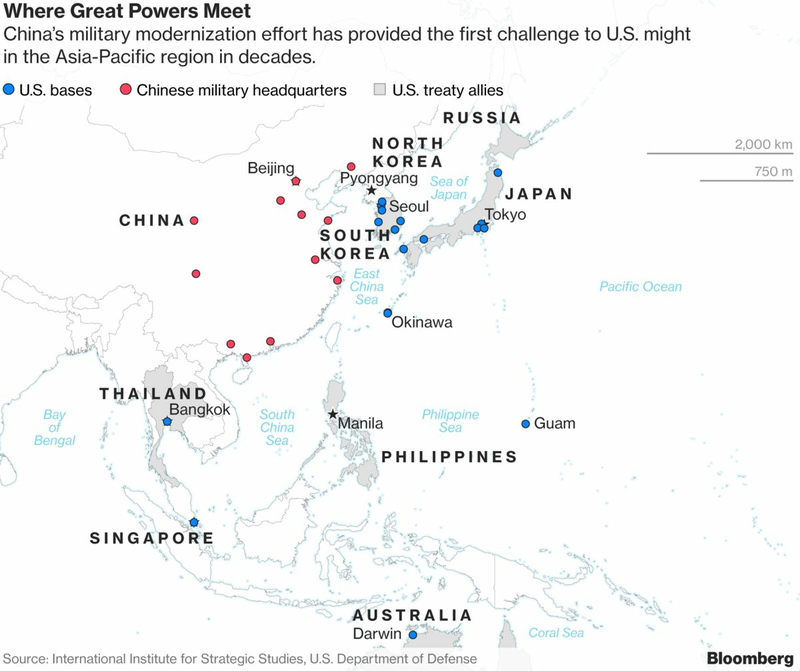 Should China join a second Korean conflict, that firepower would make it harder for Trump to ensure the safety of the U.S. homeland — much less its bases and allies across Asia. And don’t forget Russia, which shares borders with China, Japan and North Korea. Russian President Vladimir Putin is already challenging the U.S. in hotspots around the world. The U.S. is constantly engaging with China and Russia to explain what it would do in a conflict to minimize the chance of an escalation, Bermudez said. With Republicans in full control of Congress and the White House, the term was filled with controversy. The Senate conducted a flurry of business on what was effectively its final workday of the summer, confirming dozens of executive-branch nominees to the State Department, the Treasury Department and other agencies. In addition, two bipartisan pairs of senators unveiled legislation to prevent Trump from firing special counsel Robert S. Mueller IIIwithout cause, and a group of Republican senators released a border security plan. But as they wrapped up their work this week, Republican senators were eager to turn the page on the sharp political and policy disagreements and constant White House chaos that stalled their endeavors. Many GOP lawmakers are still numb from last week’s failure to repeal and replace the ACA. While the House had earlier worked through painful disagreements and false starts to pass a health-care bill — and cheered with the president in a Rose Garden ceremony afterward — the Senate failed in a dramatic early-morning vote last Friday. The breakdown of the effort to fulfill a seven-year promise left a particularly bitter taste in the mouths of Republicans departing from both sides of the Capitol. Some blamed Trump, saying he did not sell the plan aggressively enough, or Senate Majority Leader Mitch McConnell (R-Ky.) for failing to deliver. Others were critical of Murkowski and Sen. Susan Collins (R-Maine), who were adamant in their opposition to the health-care proposals that McConnell put together in secret. The two joined with Sen. John McCain (R-Ariz.) to kill a last-ditch bill to keep talks alive. Now, there is a tension about the way forward. Trump and some conservatives have said they are determined to keep prioritizing the repeal-and-replace effort. But Senate Republican leaders have moved on to a tax overhaul, the next big GOP target, with some planning more-modest fixes to the ACA on the side. The tax effort, which lawmakers hope to dive deep into next month, could prove to be another tricky venture. Republicans must resolve intraparty disagreements and juggle other pressing deadlines as they pursue a broad overhaul. McConnell is especially proud of confirming Neil M. Gorsuch to the Supreme Court, a feat widely hailed in the Republican Party. Congress also passed a slate of regulatory changes under the Congressional Review Act, rolling back Obama-era rules. But when it comes to the core policy issues they campaigned on, Republicans foundered. 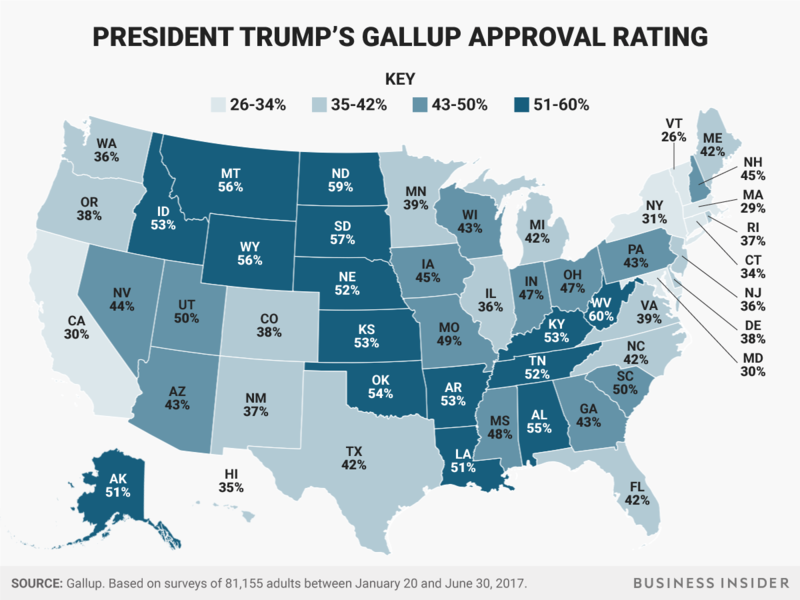 We MUST look into this– state by state. If true–WOW!